Save the Thorncrown Chapel by Signing a Petition to Stop SWEPCO from Destroying the Surrounding Landscape! 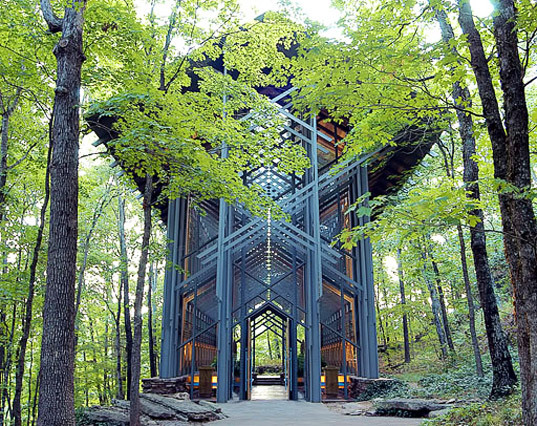 In 1980, E. Fay Jones, noted architect and apprentice to Frank Lloyd Wright, unveiled the Thorncrown Chapel – a magnificent glass and timber construction located in the middle of a thicket near Eureka Springs, Arkansas. The chapel is one of the world’s finest examples of organic architecture and it has become a beloved monument for the people of Eureka and architecture enthusiasts across the globe. 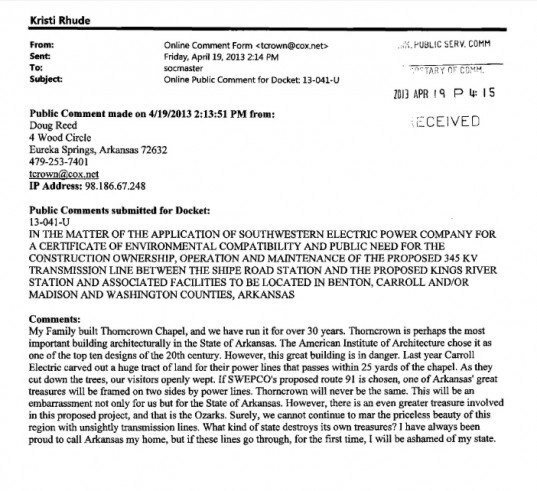 Unfortunately, the Southwest Power Company (SWEPCO) recently submitted an application to the Arkansas Public Service Commission (APSC) to construct a 48-mile-long high voltage transmission line across Northwest Arkansas that will encroach upon the Thorncrown Chapel‘s untouched landscape. While a number of community members have voiced their opposition, much more support is needed – sign this petition to stop SWEPCO from destroying the site of this important work! SWEPCO’s proposed transmission route would cut a 150-foot wide swath pierced by 150-foot tall transmission towers that would obstruct the views of the Thorncrown Chapel, as well as destroy a significant section of the Ozarks. Doug Reed, whose family commissioned Jones to design the chapel, has submitted a letter to the APSC voicing his concerns regarding the new line. However, it won’t be enough to stop the ASPC from moving forward. Please sign this petition to preserve this beautiful structure so that future visitors can enjoy the chapel as the architect intended when he designed it over 30 years ago. What has been the outcome to date, as of March 2014? I and thousands of others, would hate to see the surroundings of the beautiful chapel destroyed for any reason at all. Surely another route can be chosen. I'm quite sure SWEPCO can come up with another route and leave site alone!! !